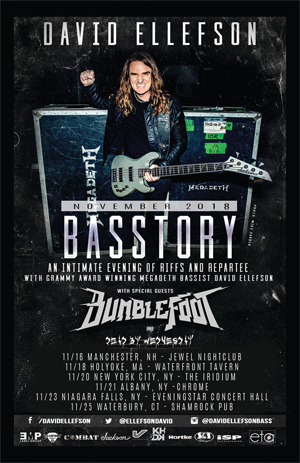 Grammy Award Winning MEGADETH bassist, author, entrepreneur, and Metal Icon David Ellefson has announced a string of East Coast dates for his BASSTORY tour, with special guest BUMBLEFOOT (ex-GUNS N' ROSES, SONS OF APOLLO) and opener DEAD BY WEDNESDAY. These are in addition to already announced dates in Europe, the Pacific Northwest, Texas, and a special run of Midwest dates with support from COMBAT RECORDS artists GREEN DEATH and WRATH. Dubbed “Basstory: An Intimate Evening of Riffs and Repartee with David Ellefson”, the show combines solo bass performance with David’s celebrated brand of storytelling, as he recounts intimate details of his struggles and triumphs in the name of Rock N’ Roll. BASSTORY will also include special VIP meet and greets, exclusive merchandise, and more. Ellefson performed an intimate BASSTORY MASTERCLASS preview in IOWA last week, as part of his induction into the IOWA ROCK N’ ROLL HALL OF FAME. + Private events. No public ticketing available.